I’m in Munich and I cannot avoid the cliche. Grasping a massive foaming stein of beer in the Hofbrauhaus, chomping on a sausage, oompah band in full boom in the background; grasping a small foaming stein of beer in the Victualienmarkt’s communal beer garden and chomping on a sausage for lunch the day before; queueing behind a rotund man in lederhosen and a manicured moustache, grasping a foaming stein of beer and a sausage in the English Garden. The very language of Munich parps and harrumphs like an onomatopoeic oompah band; Bavaria, beer, bratwurst, Hofbrauhaus. I find myself walking the town parrrumping and oompfhing like Gert Frobe in Those Magnificent Men in Their Flying Machines. Beer and sausages – pa-raarp – sausages and beer – oomph – beer, boom, beer, bwarp, sausages, pumpfh. And beer. And it’s not even October. But that’s the Munich in pictures. The Munich in the Facebook photos. Even, dare I say it, the Munich in the tourist brochures. This is not to say that I don’t like sausages. I do. And beer, for that matter. They’re particularly moreish with that sweet grainy Handlmeier mustard and a pretzel the size of a coiled bowline on a naval frigate. You can see why they’re popular and why they’re everywhere and why they’re the Bavarian’s staple lunchtime repast. 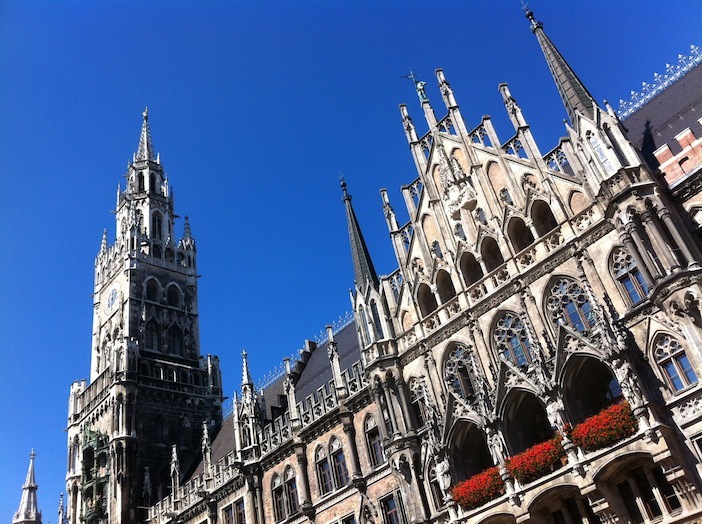 But there is a lot more to the city than Munchen (sorry) on sausages. And it begins at the Bayerischer Hof. The Bayerischer Hof – literally, Bavarian Hotel – stood, and stands, for everything the city represents. Commissioned in 1841 by King Ludwig I to attract distinguished guests to the city it shows off its regal credentials from its facade to its famed glass atrium. It is the city’s centrepiece. Still owned by the family that purchased it in 1897, it’s a testament to Bavaria’s sense of tradition, of familial pride and patronage, of the wealth that characterises the region. Tradition is something rooted in Bavarian culture; the cliched image of the bratwurst and lederhosen still exists; I noticed a pair of the latter anachronistically taking pride of place in the window of one of the main street’s most haut couture fashion houses. It’s an image alone that sums up what makes up Bavarian culture because here, too, is one of the most progressive cities in the world, particularly when it comes to business and finance. They were unaffected, like much of Germany, by the financial crisis, for such inherent wealth that firmly cements the economy. A case of the old propping up the new…or, arguably, the opposite. I’m a traditionalist when it comes to architecture. I like my buildings old. Walking through the city centre, I gazed upon gable and tower, facade and lintel in admiration, oblivious to one glaring anomaly – and it wasn’t the life-size version of Trumpton we passed en route to the Victualienmarkt; none of these buildings were original. Marvelling at the medieval architecture on the first day I had completely missed that there had been a war, an all-consuming, nigh on all-destroying war. It says something of Bavarian culture that, when 80% of the city had been destroyed by allied attrition, they didn’t take the opportunity to modernise – they rebuilt the old one. To the brick. 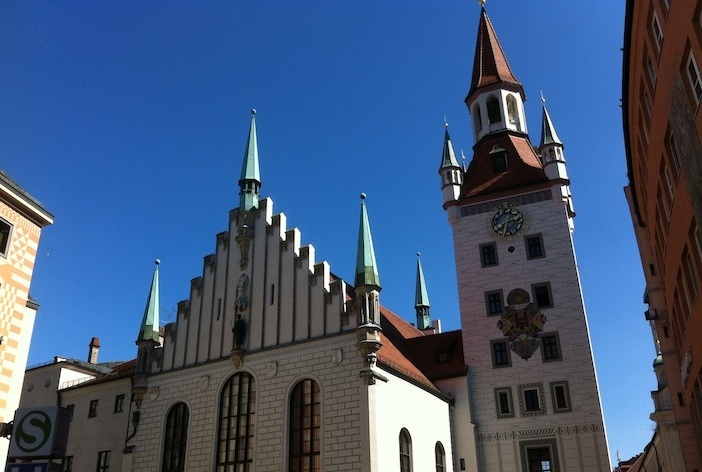 Even the Rathaus, the town hall. That takes some believing when, on our final day, this news now evident to me, I stood with the crowds watching the 42-piece glockenspiel figures dancing to the 11 o’clock chimes and cast my eye across its intricate stonework. This was rebuilt? My first sight of Munich, bar the drive from the airport, was over the city’s rooftops to the Franziskirche from the new roof terrace of the hotel; and it struck me that for such a progressive society there was not a high-rise to be seen. With one exception; the TV tower. A monolith that elicited such consternation when it was erected that it was decreed no subsequent building should exceed the height of the Franziskirche’s onion domes, lest their beautiful city be blighted. The Bayern mentality in action. And a canny move, one might think, since they avoided the concrete craze of the 60s that scars many cities today. As a consequence the city is beautiful, bold, majestic. It’s no wonder tradition has been maintained when one can be as proud of one’s home city as this. Massive avenues gleam, their buildings’ brickwork unspoilt by soot, municipal museums are each given plenty of breathing space between each other, and this urban open space is typified by the English Garden; bigger than Central Park, within minutes you’re not even sure you’re in a city any more. And was there ever an image for contemporary society than a young man in Bermuda shorts carrying a surfboard passing a Gothic cathedral. The English Garden’s waterways feature a wave facility. 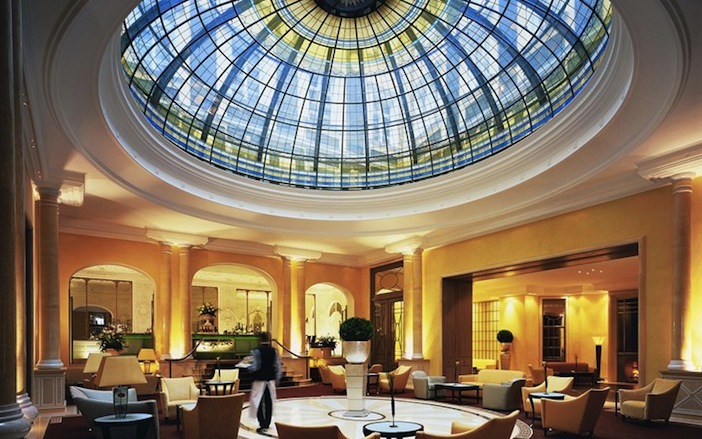 At the centre of it all, the Bayerischer Hof seems to embody Munich’s blend of a traditional facade and contemporary heart. It, too, was flattened during the war. Its only surviving room was what is now the Falks Bar, the former Mirror Hall, discovered under the rubble by then owner, Falks Volkhardt, completely intact, including its ornate rococo stucco work and ceiling-height mirrors which still adorn the walls. All other tradition has been reconstructed. Not that you’d know, the murals look as Wagnerian as the day and the 40-odd conference rooms (it’s a central hub in more ways than one) ooze old world charm. Our suite, too, is a beautiful monochromatic Art Deco. Beautiful, I thought, particularly since I learned that the current owner incumbent, Frau Volkhardt, great-granddaughter to the original owner, takes a hand in design personally. I imagine her casting a judicious if indifferent eye over plans and mood boards. But, no, she is an interior design maniac. The hotel’s suites are in a constant state of flux, guided by whim and trend. The former often influencing the latter. Whole floors are re-sculpted at a time – we just happened to be on one given the Deco treatment – and individual suites become canvases for creativity. You can return to the Bayerischer Hof mere months from a previous visit and find your old room given a new interior. And, I have to say, they’re fabulous. There is nothing here that would deter any guest; there is, truly, a suite for everyone. And everyone has come to the Bayerischer Hof. I don’t know many other hotels that list their guest alumni on their website. It’s certainly maintaining the tradition with which it was founded. And some suites are even created in the image of their distinguished guests. One such is a shrine to Thomas Gottschalks, Germany’s answer to David Letterman; a wall-sized mosaic mural of his grinning mug for a headboard the centrepiece among garishly contrasting modern art and furniture. Tradition and trends seem to extend to the hotel’s facilities, too. The rooftop pool, an undoubted highlight, blends its contemporary design seamlessly into the building’s fabric and provides a vantage point across the city. Here, too, the new terrace restaurant, an extension of the spa facilities, surely provides one of the more unique dining experiences in the city, particularly given the hotel’s proximity to the Franziskirche. And, fortunately, that TV tower is not in sight. At the opposite end, the traditional one is the Palais Keller which, as its name suggests, is situated in the vaulted 15th century cellar and provides feasting on hearty Bavarian fare. As if copious sausage wasn’t enough for lunch, I subsumed a hundredweight of pig in many guises served on a foot-thick block of wood and a barrel of pickled cabbage that evening. It seemed the thing to do. I couldn’t come to Munich and dine over Thai in Trader Vic’s, in spite of its fame in the city. I’m Bayern, after all. At least for the weekend.